In Conan the Destroyer, Conan goes on a quest because he is promised by the Queen Taramis that, if he is successful, she will revive his love Valeria. Valeria was killed in the first movie, Conan the Barbarian. Conan goes on his adventure with a thief, a wizard, a princess, and one of the queen's warriors (played by Wilt Chamberlain). This is a fun action movie with swords and magic instead of guns. 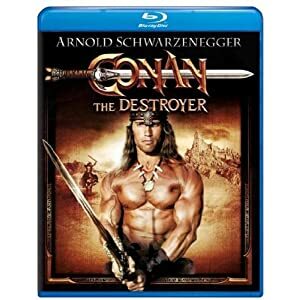 It's recommended for Arnold fans, guys who loved the Conan books, and lovers of fantasy, action and adventure movies. As Conan says, "Enough talk!" - buy the movie!